Professor Kishori Saran Lal, M. A., D.Phil. (b. 1920), took his Doctorate in History from the University of Allahabad in 1945. Starting his career as a part-time lecturer in the same university, he joined the Central Provinces (now Madhya Pradesh) Educational Service in Late 1945. As Professor of History at Bhopal, he became the Secretary, Madhya Pradesh Itihasa Parishad and Convener, Regional Records Survey Committee, Madhya Pradesh. Dr. K. S. Lal was Reader in History at the University of Delhi from 1963 to 1972 and Professor and Head of the Department of History at the Universities of Jodhpur and Hyderabad from 1973 to 1983. Professor Lal participated in many seminars and conferences, both national and international, in India and abroad. He presided over the Medieval History Section of the Indian History Section of the Indian History Congress in 1958, Punjab History Congress in 1975, Rajasthan History Congress in 1978 and Indian History and Culture Society in 1984. In 1977 he chaired a session of the Association of Historians of Asia held in Bangkok. 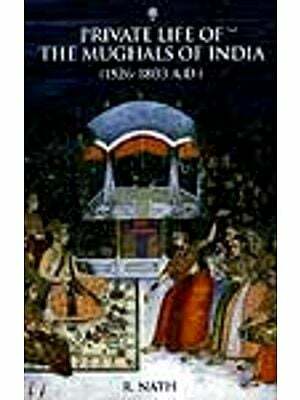 Prof. Lal has published a number of articles and monographs on medieval Indian History. Some of his famous works include Growth of Muslim Population in Medieval India, Early Muslims in India, etc. at the present age of 67, Professor Lal is looking forward to write at least half-a-dozen more books and mono-graphs. The Mughal Harem is a maiden attempt at research in the hitherto over-looked area of social history of medieval India. For, in contrast to the history of the kings and nobles, which has been the main sphere of study of medievalists, the present work deals with the life of the ladies of Mughal royalty and nobility cloistered in their harems. 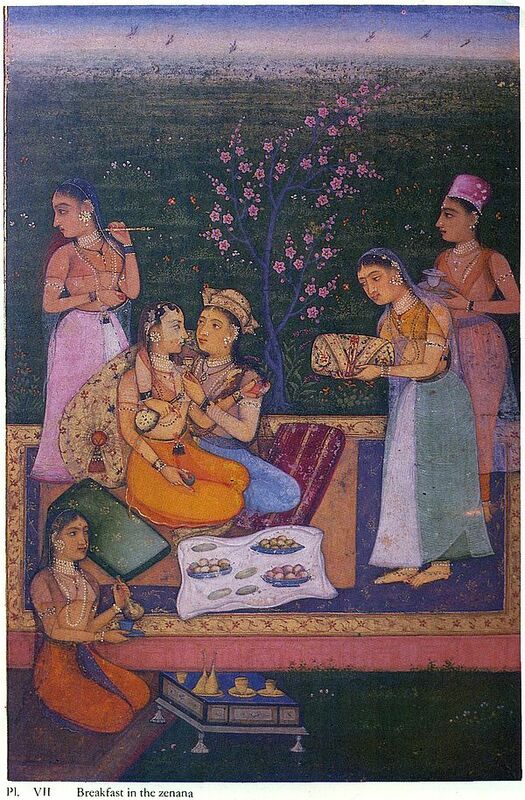 The Mughal harem was a queer establishment wherein mothers and aunts, sisters and cousins, wives and concubines, princesses and dancing-girls, all lived together as in a joint family. They all adorned themselves in pearls and fineries. Even maid-servents and dancing-girls dressed and looked like princesses. Love was the motto of all and in this eunuchs and slave-girls helped their patrons of both sexes. 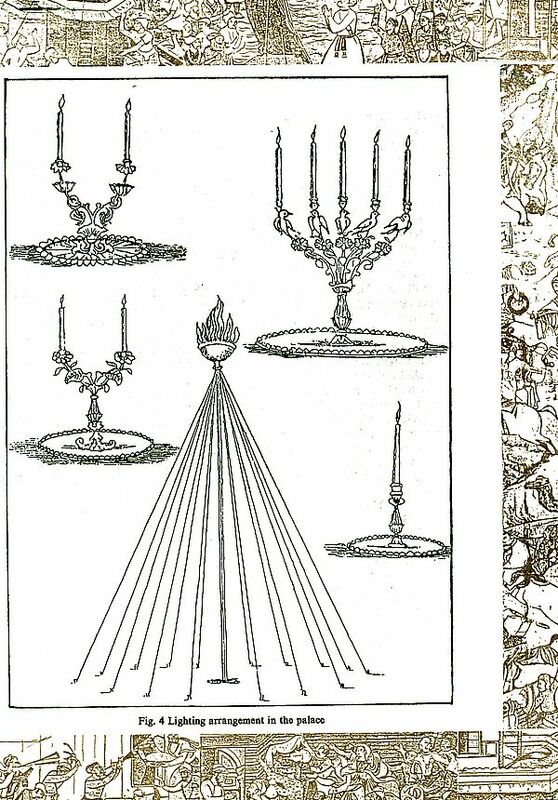 The book attempts to recapitulate this day-to-day life of the ladies of the seraglio. Their tastes and temperaments, their riches, their buildings, their gardens and garden parties, their hobbies and pastimes, and how they lived and loved, enjoyed and suffered have been brought out in proper perspective. This being a work of research, it is not a spicy record of sheer hot love. No attempt; has been made to romanticize things; still harem was Afterall harem - a place of beauty, love and romance and philanderings and love affairs of kings and nobles, princes and princesses, Begums and eunuchs - and these have been freely narrated. The romances of the spinster princesses and their unrequited love have been discussed without inhibition. The use of intoxicants in the harem led to excitement and passion and resulted in jealousies, tensions, vilification and vengeance. Gossipping and whispering were the harem's all time preoccupations. The women of the seraglio were not independent personalities and their activities were constantly under surveillance. This added to the mysteries of stolen pleasures. 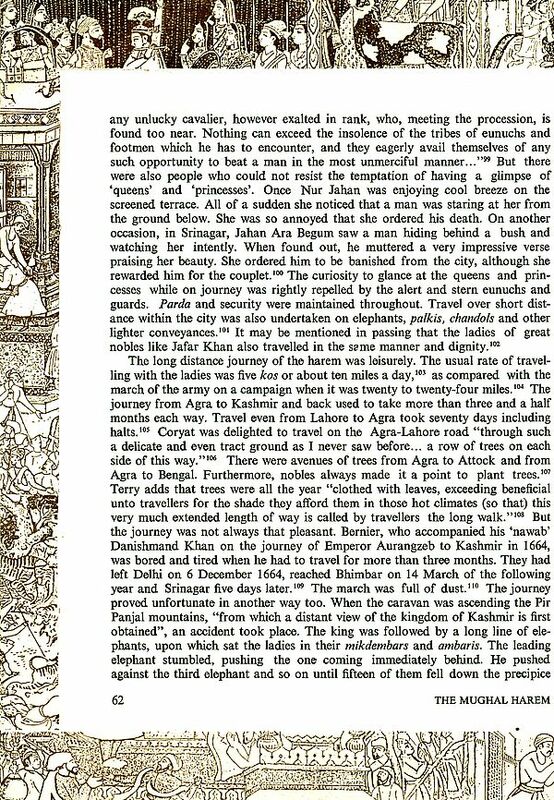 The delicate and delightful task of recapitulating the life-pattern of the Mughal harem has been deftly handled. It is hoped that scholars and laymen both will enjoy immensely reading it. In the present work Mughal harem means the harem of the Mughal emperor, the seraglios of royal prince and important nobles, but primarily the harem of the King. By King is meant all the Mughal emperors from Babur to Bahadur Shah Zafar, but in particular Akbar and his three successors-Jahangir, Shahjahan and Aurangzeb. 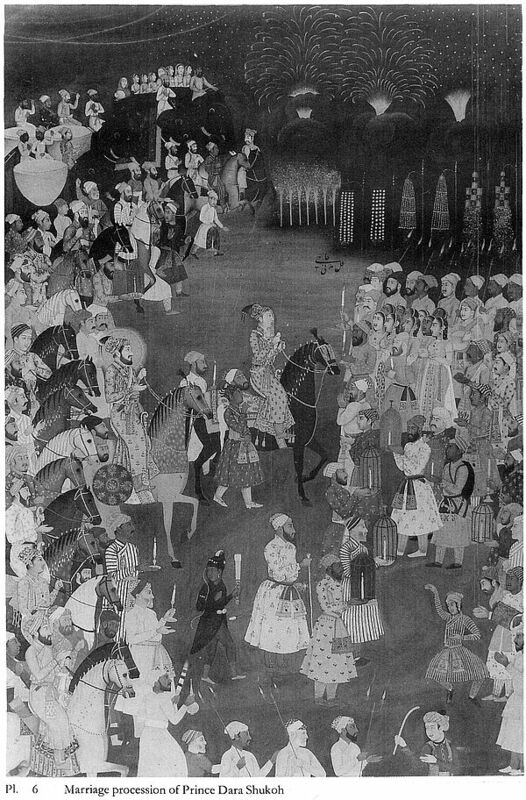 Akbar gave the Mughal harem an elaborate administrative set up, which during the time of his successors developed into an elegant and sophisticated Institution. The locale of the harem was Agra, Delhi, Fatehpur Sikri and Lahore, where the King and the important nobles lived. It was also Ahmedabad, Burhanpur, Daulatabad, Mandu, and Srinagar in Kashmir as well as in so many other towns, cities, and camps; for the harem had to be wherever the king was. But then it was primarily Agra and Delhi, the two permanent capitals of the Mughals. 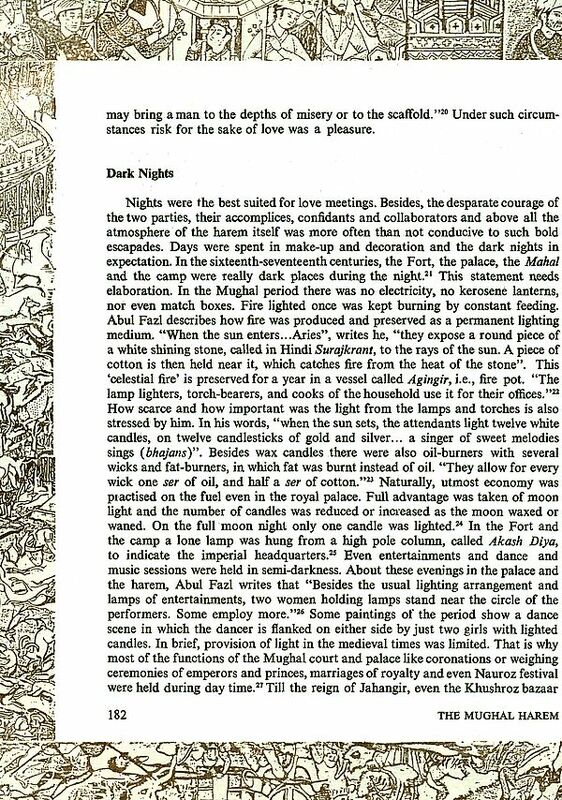 The Mughal harem was not a magic arbour full of lovely females. 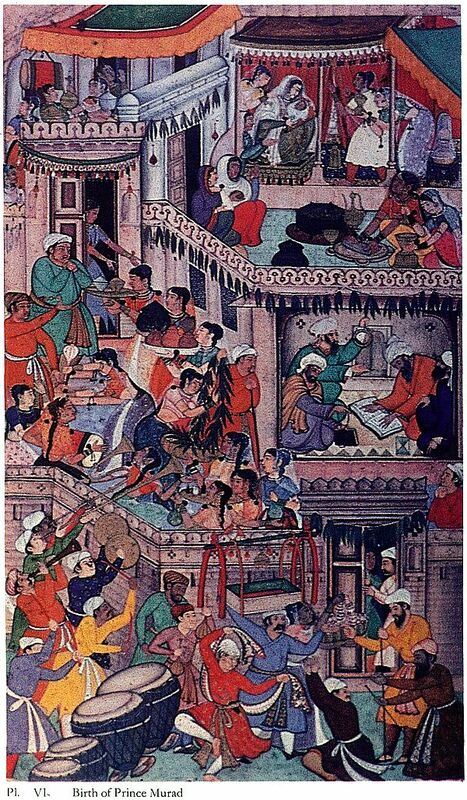 It was a queer establishment wherein mothers and aunts, sisters and cousins, wives and concubines, princesses and minor princes, dancing-girls and maids, besides of course choicest beauties for the master's pleasure all lived under one roof as in a joint family. Each lady had a distinct role to play and each was treated with deference, admiration, adoration and strictness as was her due. At the apex was the queen mother or the mother of the reigning king, followed by the chief wife and secondary servants, slave-girls and entertainers-that swelled the size of the harem. The Mughal harem was notoriously large. The present work attempts a study of these women-queens, concubines, princesses, dancing-and slave-girls. 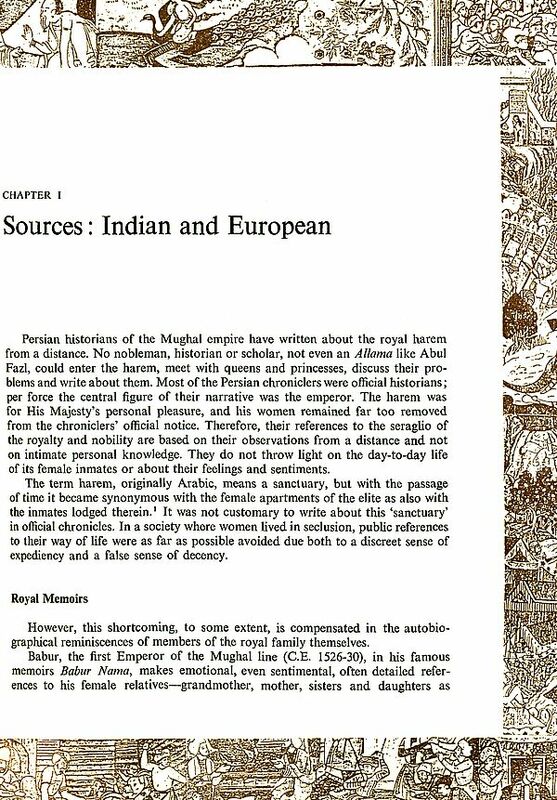 Thus in contrast to the history of the Mughal kings and nobles, which has hitherto been the main area of study by scholars of medieval Indian history, the present work deals with the life of the ladies of Mughal royalty and nobility. In his sense, this is a maiden attempt in a new sphere, a research on the hitherto overlooked area of Mughal social history. But contrary to probable expectation based on the title of the book, it is not a spicy record of sheer hot love. At the same time it is also not a drearycatalogue of ornaments worn by the women from head to foot, or items of their toilet or wardrobe. It also does not repeat what is either already known or is polemical. It does not give details of marriage celebrations in the seraglio, nor the technicalities of the games played or plots of stories read or told. It also does not dilate on the controversies regarding the place of women in Muslim society, or the growth of elaborate parda among them. 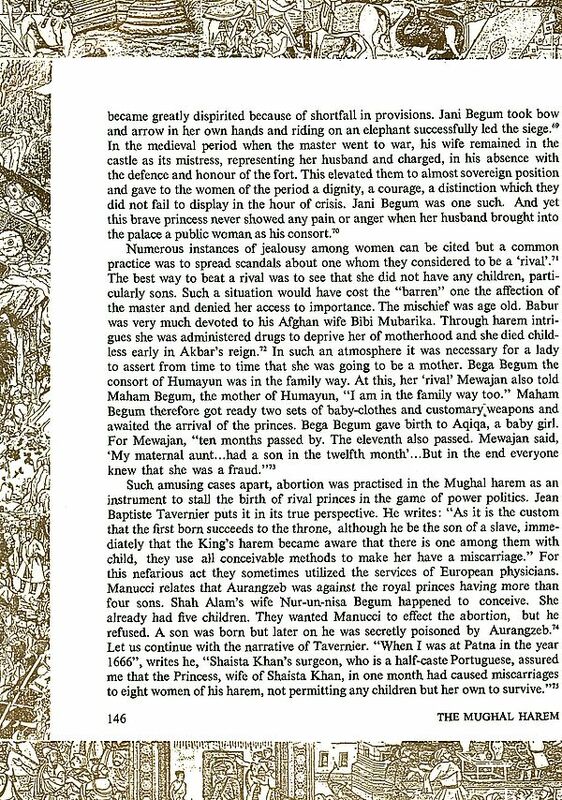 What it attempt has been made to romanticize things, still love affairs and philanderings of the Begums and princesses have been freely narrated. The tastes and temperaments of the ladies of the harem, how they lived and loved, enjoyed and suffered. Have been brought into proper perspective. Ladies of the seraglio were not independent personalities. 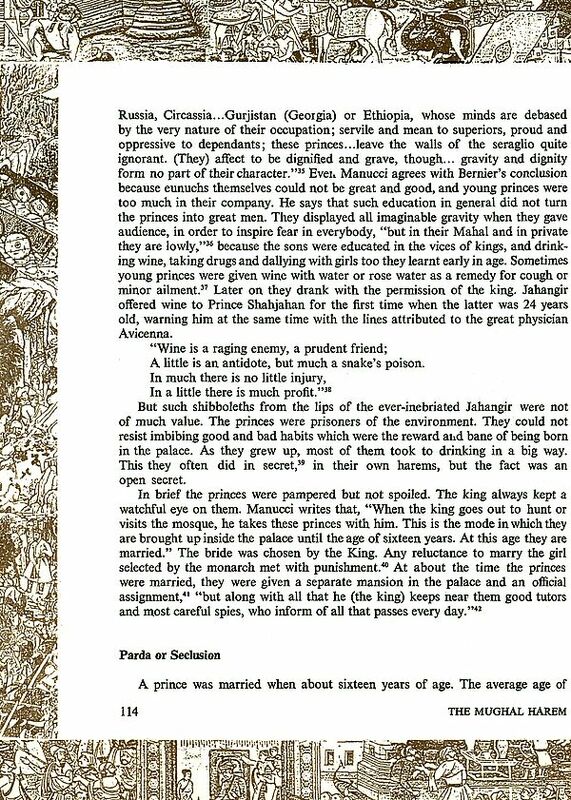 Most of them existed solely for the purpose of giving sexual pleasure to the king or master. Their activities were constantly under watch by matrons, eunuchs and guards. The harem was a living symbol of the abuse of power of arms, wealth and luxury. 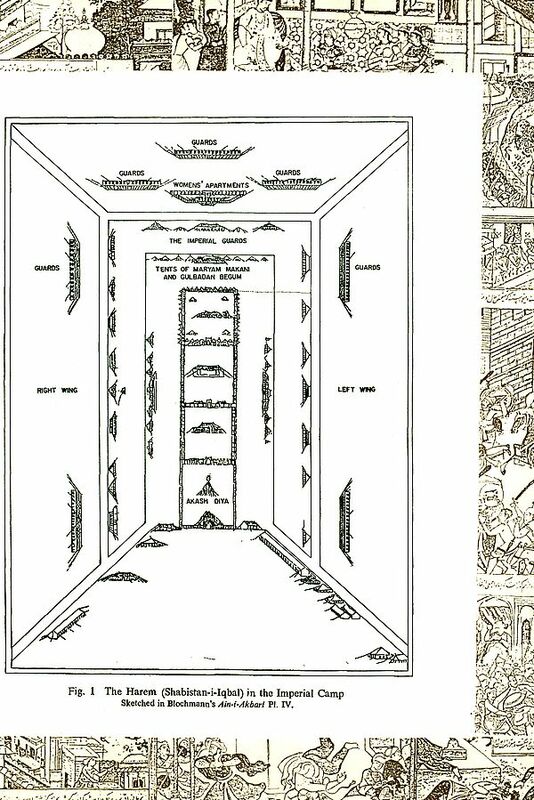 The genesis of this monograph may be briefly stated. 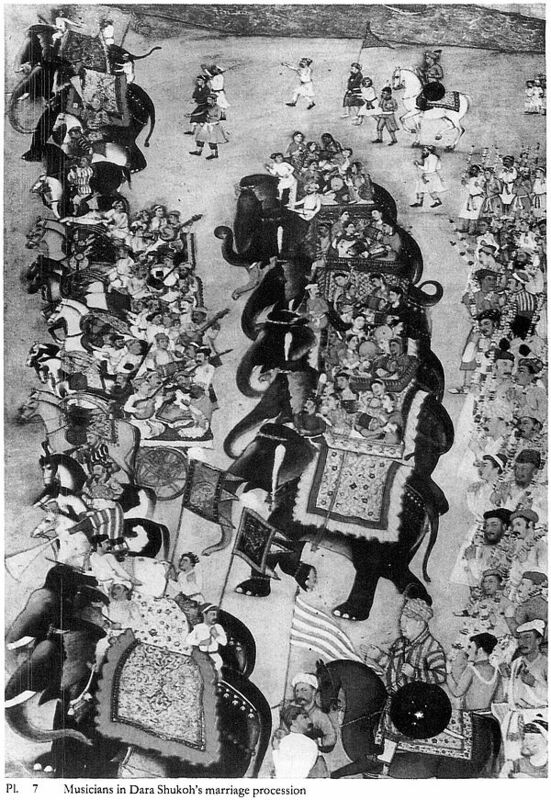 In the Journal of Indian History, Vol. 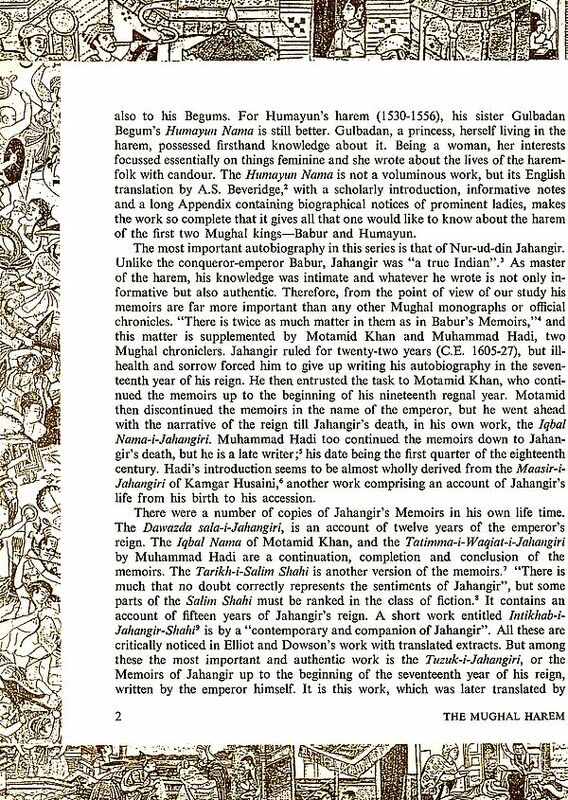 LIII, Part III, December 1975, I published an article under this very title, viz., 'The Mughal Harem'. My esteemed friend Dr. S. P. Gupta suggestion appealed to me and the result is before you. Dr. S. P. Gupta kept up his interest in the work from its inception to completion, even arranging for its publication through the Centre for Research and Training in History, Archaeology and Palaeo-environment. He is, therefore, the first claimant to my gratitude. Many other friends have also lent their co-operation in the preparation of this work. Dr. L. P. Sihare, Director of the National Museum, New Delhi was kind enough to permit me to reproduce some Mughal paintings pertaining to the harem and owned by the Museum. Ms Daljeet of the National Museum assisted me in the selection of paintings for the book. There are scores of them out of which only a few could be included in full. Some others have been sketched by Shri Lalit Jain on the borders of the pages of the text. 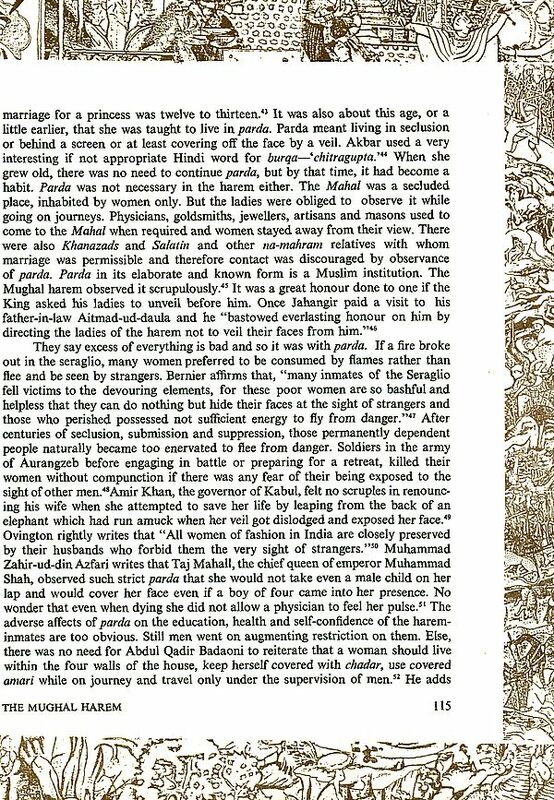 These as well as the line drawings help in completing the story of the Mughal harem as it were. Shri Kushal Pal set the layout of the illustrations in a most splendid way. They are all recepient of my gratitude. Professor K. A. Nizami showed keen interest in the progress of the work as did Professor Devahuti. Professor Nizami also helped in the translation of some Persian couplets into English. Ms Pushpa Sharma of Kurukshetra brought to my notice some Rajasthani source materials having a bearing on the Mughal harem. Ms Asha Vohra and Shri K. S. Ramachandran were kind enough to carry out the editing of the manuscript. The latter also saw the volume through the press. I am grateful to all these and many other friends not mentioned here by name. My thanks are also due to the Directors of the Libraries of the Archaeological Survey of India, the National Museum, New Delhi, the University of Delhi and the Centre of Advanced Study in Medieval Indian History, Aligarh Muslim University. It is principally in these libraries that the study was done. Dr. A. K. Das, Director, Maharaja Sawai Mansingh Museum, Jaipur, procured the colour transparencies from institutions outside India. Shri O.P. Tandon, Director, Bharat Kala Bhawan, Varanasi provided a few colour slides from his collection. To them also I am indeed thankful. A trifle liberty has been taken with spellings. At many places the spellings o the old English words of European travellers of the sixteenth-seventeenth century have been changed to modern ones to make their narratives easy to comprehend. 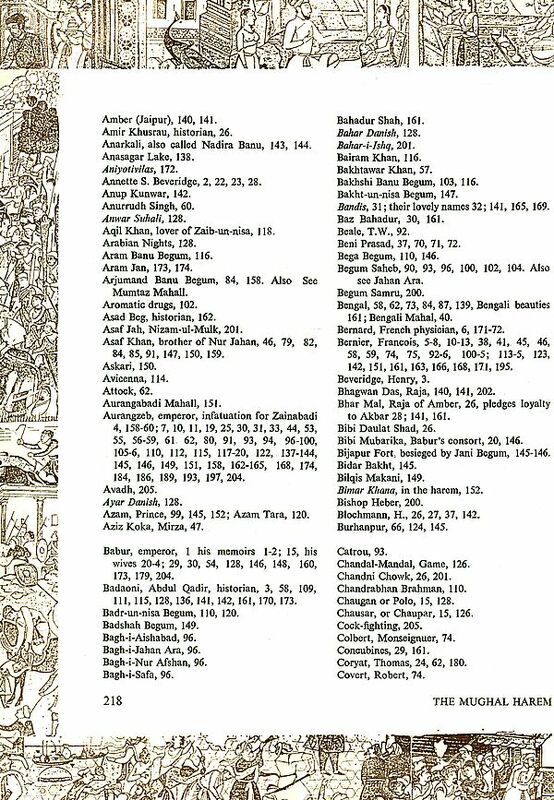 Foreign writers give varied spellings for Mughal names. But here spellings of proper names like Jahangir, Aurangzab, Jahan Ara and Roshan Ara Have been given in one uniform fashion, even in the case of quotations from such writers. The word Mahal has been spelt in two ways. When it is used in the sense of seraglio it is spelt with one '1'. When it forms part of a proper name, s in Nur Mahall and Mumtaz Mahall., it is with two '1s'. Also, where 'h' in a final position is silent, as in Ferishtah, it has been dropped to help in the correct pronunciation of the word. Thus Ferishtah, Namah and pardah have been written as Ferishtah, Nama and parda. Another simplification is non-insertion of diacritical marks. The nomenclature of Christian era as juxtaposed to Hijri Era had been found preferable to Anno Domini and so C. E. is substituted for A. D.
Credit for the extremely attractive get up of the work goes to the publishers M/s Aditya Prakashan, but especially to Dr. S. P. Gupta who guided them at every stage of its production. 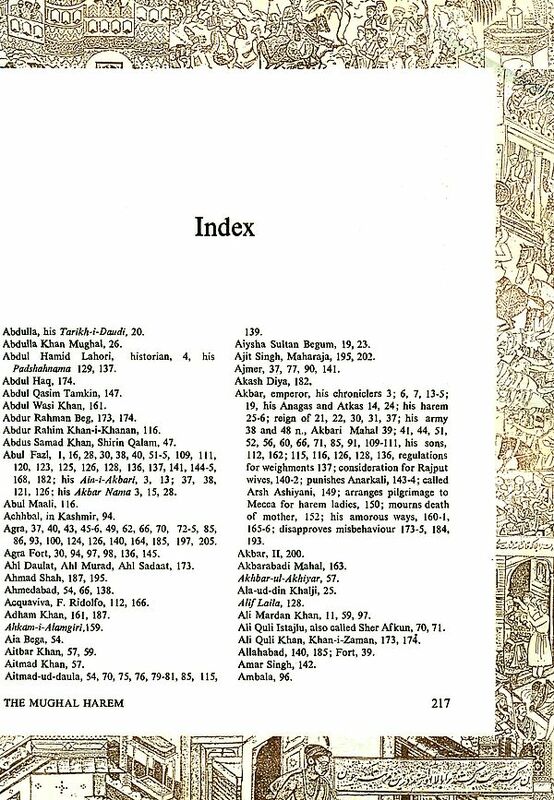 My son Deepak Lal was good enough to prepare the Index.